Update: These rankings have been updated. The next iteration is available here. As we settle into a roughly bi-annual schedule for our programming language rankings, it is now time for the second drop of the year. This being the second run since GitHub retired its own rankings forcing us to replicate them by querying the GitHub archive, we are continuing to monitor the rankings for material differences between current and past rankings. While we’ve had slightly more movement than is typical, however, by and large the results have remained fairly consistent. One important trend worth tracking, however, is the correlation between the GitHub and Stack Overflow rankings. This is the second consecutive period in which the relationship between how popular a language is on GitHub versus Stack Overflow has weakened; this run’s .74 is in fact the lowest observed correlation to date. Historically, the number has been closer to .80. With only two datapoints indicating a weakening – and given the fact that at nearly .75, the correlation remains strong – it is premature to speculate as to cause. But it will be interesting to monitor this relationship over time; should GitHub and Stack Overflow continue to drift apart in terms of programming language traction, it would be news. Besides the above plot, which can be difficult to parse even at full size, we offer the following numerical rankings. As will be observed, this run produced several ties which are reflected below. R: Advocates of R will be pleased by the language’s fourth consecutive gain in the rankings. From 18 in January of 2013 to 13 in this run, the R language continues to rise. Astute observers might note by comparing plots that this is in part due to growth on GitHub; while R has always performed well on Stack Overflow due to the volume of questions and answers, it has tended to be under-represented on GitHub. This appears to be slowly changing, however, in spite of competition from Python, issues with the runtime itself and so on. Go: Like R, Go is sustaining its upward trajectory in the rankings. It didn’t match its six place jump from our last run, but the language moved up another spot and sits just outside the Top 20 at 21. While we caution against reading much into the actual placement on these rankings, where differences between spots can over-represent only marginal differences in performance, we do track changes in trajectory closely. While its 21st spot, therefore, may not distinguish it materially from the languages directly above or behind it, its trendline within these rankings does. Given the movement to date, as well as the qualitative evidence we see in terms of projects moving to Go from other alternatives, it is not unreasonable to expect Go to be a Top 20 language within the next six to twelve months. Perl: Perl, on the other hand, is trending in the opposite direction. Its decline has been slow, to be fair, dropping from 10 only down to 12 in our latest rankings, but it’s one of the few Tier 1 languages that has experienced a decline with no offsetting growth since we have been conducting these rankings. While Perl was the glue that pulled together the early web, many believe the Perl 5 versus Perl 6 divide has fractured that userbase, and at the very least has throttled adoption. While the causative factors are debatable, however, the evidence – both quantitative and qualitative – points to a runtime that is less competitive and significant than it once was. Julia/Rust: Two of the first quarter’s three languages to watch – Elixir didn’t demonstrate the same improvement – continued to their rise. Each jumped 5 spots from 62/63 to 57/58. This leaves them still well outside the second tier of languages, but they continue to climb in our rankings. For differing reasons, these two languages are proving to be popular sources of investigation and experimentation, and it’s certainly possible that one or both could follow in Go’s footsteps and make their way up the rankings into the second tier of languages at a minimum. Swift: Making its debut on our rankings in the wake of its announcement at WWDC is Swift, which checks in at 68 on our board. Depending on your perspective, this is either low for a language this significant or impressive for a language that is a few weeks old. Either way, it seems clear that – whatever its technical issues and limitations – Swift is a language that is going to be a lot more popular, and very soon. It might be cheating, but Swift is our language to watch this quarter. Big picture, the takeaway from the rankings is that the language diversity explored most recently by my colleague remains the norm. While the Top 20 continues to be relatively static, we do see longer term trends adding new players (e.g. Go) to this mix. Whatever the resulting mix, however, it will ultimately be a reflection of developers’ desires to use the best tool for the job. There are now 1,418 projects. In 5 days it has grown 23.3 %! It’s “program” not “programme”. “Programme” is a word for a British TV show. It may be more interesting to look at the anti-correlated axis to see the difference in focus of the two ‘tools’ (github vs stackoverflow). Awk, Io SQL and XML have lots of questions rather than code storage, while Common LISP, Tex and VimL have stored code rather than Q&A. You can see which languages have their own independent Q&A forums (e.g. Lua, below the line), along with which languages are the new/popular kids on the block that folk want to know about (Swift, above the line). Where did you leave Cobol and Basic or QBasic ? I left my QBasic on my old 386 when i gave it away to the gardner in 1998 and got myself a new shiny IBM pentium pro computer with a bigger 17 inch monitor for only $3500 Australian dollars on a 18 month interest free deal with GE Credit. I then proceeded to buy a copy of Visual Basic Pro version 6 and use that instead. Almost the same language as QBasic and with a real GUI and database. I re-implemented my lotto program and began working of real games with all that power availiable. As for Cobol, never used it and Basic, well GW Basic was left quite a while before that. Those languages are necessary for the charts, I think. GitHub is currently listing 42 repositories total containing COBOL, and 0 for Basic or QBasic, which means that they’re not showing sufficient usage to be included in these rankings. For Basic, I can understand that, but it is still used. Can the upward trend in R in github (and not on SF) due to the Coursera MOOC asking students to post the solutions on github ?. Those number of submissions are really huge and this can skew the results we are seeing. They weren’t grouped, they are tied for spots 1 and 2. I spent 30 years writing code in that god-awful IBM RPG. Thank God I’m retired. Somebody was asking me the other day if I wanted some freelance work in RPG. They’re porting it to dotnet. Using a dotnet version of RPG…. column counting! ugh! RPG IV wasn’t *THAT* bad though …. Visual Basic is still in the top 20! I guess reports of it’s death have been greatly exaggerated! I think that it’s most due to VB.NET. But I also agree w/ you… we will always have people in IT proclaiming the death of some language. Another stupid story ,.. CSS? Agreed. In what deluded mind is CSS a “programming” language?? CSS has conditionals – limited, yes – conditionals nonetheless. It has a syntax, strings, integers, commands, and it’s used to alter and manipulate DOM structures as well as other utilities. 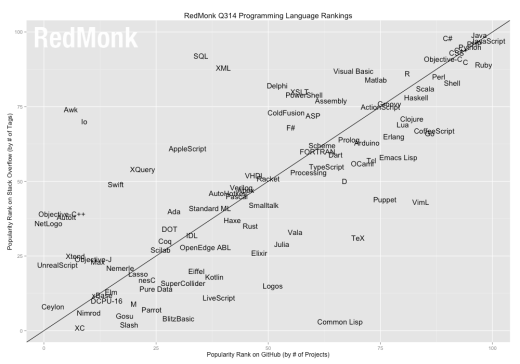 I wouldn’t say it’s delusional to count it among programming languages. It’s definitely a more hybrid markup/language – obviously “Style Sheet” is 2/3 of the acronym, but it still has programatic properties. I mean, sure you can’t write device drivers with it, and you probably can’t use it to run inode table analyses, set a css script as a cron job, or run chip level op codes with it … but it has it’s place just like everything else. I think most people who know how to program also know CSS and know where its place is. To include it isn’t a big deal and it’s not taking away from any other language by any means. I don’t really care either way – I’m not going to get all bent out of shape over it, but to each their own I guess. Even more stupid is XML here. Is there a full list of the numerical rankings anywhere? I’m curious about Delphi’s trend, especially as one of the last proprietary languages left in existence. It would also be interesting to weight some of these figures by age of language. It would seem to be meaningful if a newer language has eclipsed an older one in popularity. A ranking achieved/years in existence metric might be informative. It’s all fine and good to choose the “best tool for the job”, but one cannot ignore commercial reality. Using an obscure language, no matter how well suited to the particular task, has many drawbacks. Like in the Linux universe with its hundreds of distros, there are far too many programming languages out in the wild…and more are coming every year! I understand the concept of ‘competition’. With all of these languages competing in the ‘marketplace’, we can expect the best of the best to rise to the top. And we can expect the list of top-tier languages to change over time, as Darwinian evolution sorts out the newest and most successful adaptations. That said, most developers should focus on using the top-tier languages in order to get work done and to improve their resumes. Exploring new and obscure languages is a distraction in terms of TIME and ENERGY and sometimes MONEY, commodities that most of us have in short supply. 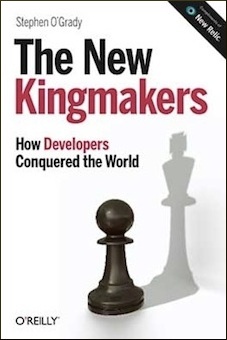 There will always be geeks who love to tinker with new languages such as Rust, Nimrod, Cobra, etc., but they are in such a small minority that we can ignore them for the black sheep that they are. While Java and Javscript do still come towards the top, the reality of jobs seems to show C#/.net being more used than your graph indiicates. Maybe github isn’t the place c# devs are going for version control. There may need to be another element added to reflect commercial jobs. My job involves coding in both Delphi and C#, but I typically wouldn’t “choose” to use them for an open source project. The licensing costs are way too high for “hobbyist” work, and they’re not “fun” languages to code. I’d much rather use something totally different like Ruby, Rust, Go or Haskell for that sort of project. But, I would still ask and answer Delphi/C# questions on SO. 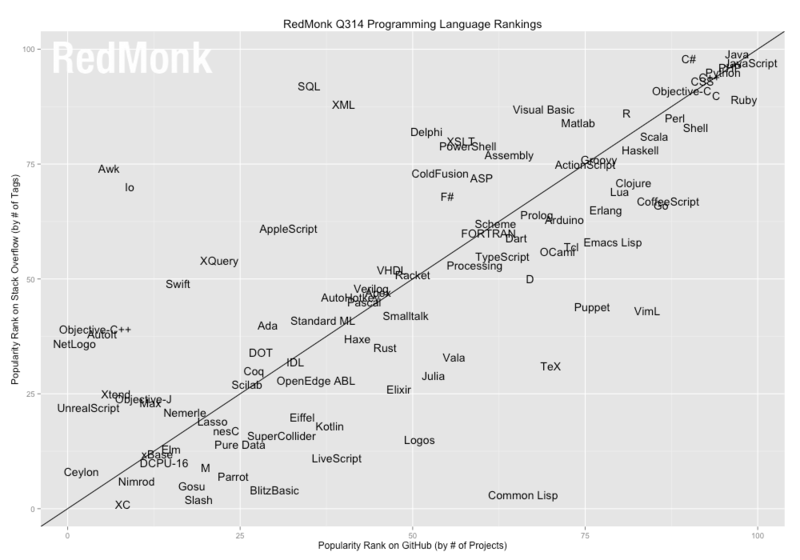 I think that explains the ranking of languages like Delphi, with a high number of SO questions, but relatively few Github repos.